Nancy Woodhull - The legacy of the late Nancy J Woodhull and the ongoing work of William D Watson and Tennessee Jane Watson . . . The legacy of the late Nancy J Woodhull and the ongoing work of William D Watson and Tennessee Jane Watson . . .
Nancy Woodhull brought a rare kind insight to a journalism career that spanned 33 years -- from her home town newspaper in Woodbridge, N.J. to the founding of the "Nation's Newspaper," USA TODAY, and well beyond. Deborah Tannen, the best selling author (Working 9 to 5, You Just Don't Understand) described her as someone with "the rare ability to glimpse the future and help to make it happen." For Tannen, a linguist with a specialty in communication breakdowns, Nancy offered a unique viewpoint. "She saw things that others didn't see and pointed them out in such a forthright way that they immediately seemed self-evident." Nancy saw her journalism career, not as a job, but a responsibility. "I guess I'm a roll-up your sleeves journalist, who believes we get in the business to serve the public," she said. "Helping the media reach diverse audiences is of tremendous importance to me." That public service extended well beyond the many news rooms she worked in as a manager or a consultant. With Betty Friedan, she co-founded Women, Men and Media, which monitors how the press covers women. As a scholar in residence at the University of Rochester, she directed media studies by a student-research team on press images of Generation X, religion and crime; and she laid the ground work for a study of nursing and the media, completed after her death. From 1990 until the time of her death, Nancy's journalistic focus was intertwined with the world-wide mission of The Freedom Forum -- the world's largest private foundation focused on the First Amendment and media-related issues. She served as trustee for six years, then senior vice president, doing media workshops for women and men from Moscow to Beijing, while helping with early planning for The "Newseum" in Arlington, VA and an expanded presence for The Freedom Forum's Media Studies Center in midtown Manhattan. "Through my work at The Freedom Forum around the world, I've learned to know how important freedom of the press is," she said. "Helping the media do their job well is both my vocation and avocation." She was also chair of the Peabody Radio and Television Awards, the "Pulitzers of broadcasting." She was vice-chair of the International Women's Media Foundation and on the advisory boards of New Directions for News, the newspaper think tank at the University of Missouri, and the Knight Center for Specialized Journalism at the University of Maryland. She attended Trenton State College for only one year, leaving in 1964, when she landed a job as a proofreader at The Evening News, Perth Amboy, N.J. By 1965 she had worked her way up to an editor's title. She was reporter at the Detroit Free Press from 1973 to 1975, when she joined the Gannett Rochester Newspapers as night city editor. There she worked he way up to managing editor by 1979. 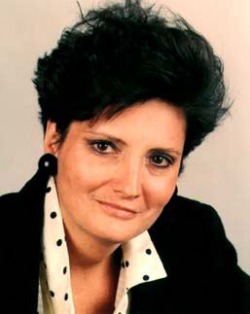 In 1982, she became a founding editor of USA TODAY and its first managing editor of news. After the launch of USA TODAY, she was named president of Gannett News Service, a national wire service, and Gannett New Media, a research and development division of the Gannett Co., which, under her direction, developed USA TODAY Radio and USA TODAY books. In 1990 she joined Southern Progress Corp., where she was executive vice president and editor in chief of five magazines, including Southern Living magazine, where she directed the redesign of the 2-million-circulation magazine. "I've made a career working on new things," she told Working Woman magazine in 1979. She explained how her first break came when she was the only person in a meeting to express excitement about a planned education page. The college dropout became education editor because: "When I hear an intriguing idea, I immediately start to think, Oh how could you do that? I don't spout negatives." In 1992, she started her own media research and consulting company, focused on helping media companies understand their changing readers, viewers and listeners -- especially women. Her clients have included major media companies both in the US and abroad. She also published of The Woodhull Report, a monthly media trends report. "Nancy was a trailblazer." in the words of The Freedom Forum's chairman, Charles Overby. "She was one of the first women to break through the glass ceiling by coming up through the ranks. Once she got through the glass ceiling, she tried to fix it so other people -- from diverse backgrounds could go through the system." Allen Neuharth, Gannett's former chairman and founder of both USA TODAY and The Freedom Forum says, "She probably took me on directly, publicly and challenged me as often as anybody I've worked with. She wasn't always right, but she made you think." Another friend, Mindi Keirnan, the former senior vice president and general manager, San Jose Mercury News, described her as a "Roaring river of influence who touched thousands on her journey to the sea. It was Nancy's belief in uniting women," Keirnan says, "that fueled her deep, deep love of the National Women's Hall of Fame." Woodhull received numerous awards but was perhaps best known for honoring others. She was a former president of the board of the National Women's Hall of Fame in Seneca Falls, N.Y. Her role there fit well with another one of her abiding philosophies. "Do something to help another woman everyday," was a motto she repeated often, and lived by. Tannen reflects: "This, it seems to me is the purest and most admirable kind of feminism. It has nothing to do with ideology. It has not a whiff of anger or hate -- just a loving dedication to action, to individual people and to making the world a better place."